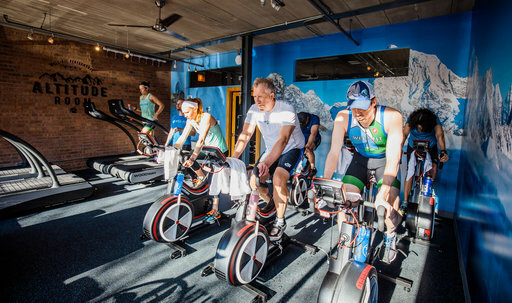 Add on a 4 week booster phase of altitude workouts and watch your times plummet! This program is supplemental to your training program and will replace some of your workouts each week. By the end of the program you will be able to run or cycle faster and longer than you would have if you had done all the workouts at sea level. The Well-Fit Altitude Booster program is based on the groundbreaking research of Dufour et all in 2006 that was published in the Journal of Applied Physiology. Your coach will direct you as to when to incorporate this into your training. In real altitude the atmospheric pressure is decreased and the air molecules are further apart making the air thinner. The percentage of oxygen in the air is the same as at sea level but there is just less air. If you need more oxygen you need to get it from a tank or wait for a few hours. In simulated altitude there is no change in atmospheric pressure and to achieve the same effect, the oxygen molecules are filtered out. The air stays at the same density but with lower percentage. If you need more oxygen you just open the door and leave the room and you are in normal oxygen conditions. The mechanism by which altitude training works is very simple – since oxygen is the primary source of energy production for the human cell, it is the key limiting factor to success and athletic ability. Exposure to altitude or reduced oxygen levels introduces a new challenge that the body must confront and adapt to maintain balance. This balance is your new level of fitness. Live High – Train High: Maximum exposure to altitude and maximum increased oxygen delivery from the lungs to the muscles achieved by increasing the amount of red blood cells. However, this method has somewhat limited performance at sea level, mostly due to inability to train at high intensity. Live low – Train High: Maximizing oxygen absorption and processing in the working muscles when using high-intensity training protocols in order to improve performance for athletes in endurance, sprinting ability, and strength. Mostly achieved by increasing the cells ability to absorb and process oxygen. As an athlete training for a race, you should have three kinds of workouts in your training plan; speed work, endurance and tempo intervals. Endurance and speed workouts will be the ones from your training program. Tempo intervals will be replaced with altitude sessions and will be provided by Well-Fit in the altitude room at the training center. All workouts will be added to your Training Peaks by your coach. EMAIL US TO ADD THIS TO YOUR PROGRAM.